One of the oldest tools in the writer's arsenal might well be the Man-versus-Nature narrative arc. From cave painting to present day, the harsh realities of survival against an indifferently hostile universe do speak to us on a visceral level. Script-wise, Joe Penna's proposition is interesting, as it stands out by getting rid of the fluff we usually pad that kind of setting with. 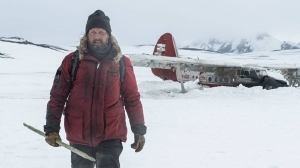 Removing the usual flashbacks, visions, dreams, exterior viewpoints until there's only a core: A man stranded in the arctic circle battling against the elements. Tragedy is classically defined in Aristotle's poetics as "an imitation, not of men but of an action that is serious, complete and of a certain magnitude". The most effective form of which should be a plot involving a man, neither overtly good nor bad, whose predicament happened outside out his sphere of control and must rise to the challenge. And it's exactly what we have here . We do not know how he ended up here, who he is nor for how long he's been there. We do witness the tedium of routine against despair and anguish, held in a status quo through sheer force of will and, in this land without night, rhythmed by the forlorn beeps of a chronograph. Foraging for food, maintaining shelter, and signaling for rescue, over and over again. Of course such a passive narrative needs a prod to move on, you can't decently fill a whole picture out of the same five scenes. In order to keep with the Classical archetype that prod would imply Spectacular equipment, a flashy intervention of some kind manifesting itself on stage , disturbing the equilibirum, and sending the hero unto a Journey. This happens quickly after the setting is in place. Once we know of the routine and of the cursed treasure that is hope, the beacon is finally heard. A rescue chopper is on the way. Salvation nears. Only to be reduced to ashes by a freak gust of wind crashing the helicopter. Talk about Spectacular. From there the story will develop following Artistotle model, we will have Complications, leading to a Reversal of situation, Peripetiae and of course the scene of Suffering. Without giving much away, there will be a survivor from the wreckage than will induce the polar (haha) inversion of the setting, the rescued becoming the rescuer. Dwindling ressources, encroaching wildlife, and guilt at being the cause of the crash will coalesce into a Journey towards salvation. Not for him but for his unconscious ward. What Artistotle defined as the Ethical motivation. We do have here, a true return to form, Tragedy in it's most ancient form, all the guidelines established eons ago followed to the letter. Almost, to the letter. Audience engagement should spring organically from the plot itself, this implies a particular rythmn ebbing and following in the travails of the characters. In our present case, that rythmn is wrong. Once the journey to salvation begins, everything accelerates in a relentless piling of avatars, mishaps, unforeseen circumstances, without a single lull until the end. And there's a turning point where that unending accumulation of calamity weighs on the suspension of disbelief. Not everyone will pass it at the same time, but it will be making everything rubberband from tragedy into utter hilarity. And i doubt that was the intended effect. It might be my schadenfreunde acting up but, at that point, the whole falls into disarray quicker than a failed soufflé deflates.